The Kindle Oasis, Amazon’s new premium ereader, was officially released today for those that pre-ordered early (Amazon currently shows new shipments arriving the beginning of June). In the meantime I wanted to post some first impressions of the new Kindle Oasis. I’ll also be posting some videos and a comparison between it and the Kindle Paperwhite 3 in the coming days, so check back soon for that. One thing I want to test for the full review is the battery life of the Kindle Oasis itself without the cover. I’m going to charge it fully and then count the hours of usage it takes until the battery needs to be charged since Amazon always dances around giving useful battery life numbers. Three things jumped out about the Kindle Oasis upon first inspection. #1. Tiny – Seeing pictures online does not give an accurate representation of just how small the Kindle Oasis is, especially when comparing it side-by-side with a normal-sized ereader like the Kindle Paperwhite 3. It’s funny how a two devices with the same size screen can be so completely different. The cover is also very slim and light, smaller than I’d expected. It’s just a flap with half a back that’s a bit thicker for the battery. #2. Nice Frontlight – The frontlight is nice and even. At the highest setting it’s brighter than the Paperwhite and I’m not seeing any weird hues of color like on the Kindle Voyage, although there is a bit of visible shadowing from the LED lights on the right side of the screen when the brightness is turned up high. It’s the best Kindle screen yet, even if it is just marginally better. #3. Super Comfortable to Hold – The design is no joke; this time it’s not just marketing BS. It actually does make the Kindle Oasis super comfortable to hold. The hump isn’t as big as it looks in pictures, and your fingers naturally curl behind the lip, with a thumb resting on a page button. It’s also quite comfortable to hold in landscape mode resting in the crook of your hand with a thumb on a button. Plus the buttons actually work in landscape mode unlike the page sensor buttons on the Kindle Voyage. The cover folds back nicely as well so it’s still comfortable to hold with it on, but it’s not as light with it on of course and the balance isn’t quite the same since the battery on the cover evens out the weight distribution. 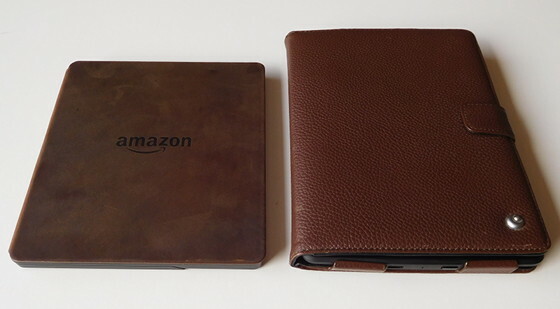 It makes it feel more like a regular ereader with the cover on, but it is considerably smaller in the case than other ereaders, as the picture above illustrates. Most people will probably prefer to shed the added weight of the cover when reading. That’s why I want to test the battery life of the Kindle alone. Check back soon for more details! Thanks for posting these initial impressions! So happy to hear the frontlight illuminates evenly… can’t wait for mine to arrive next week. One thing I don’t understand about this design with the hump on one side: yes, I see how it can be comfortable, but am I the only one constantly switching hands when I’m holding a book? Since the thin side doesn’t seem very comfortable to hold, it would mean I’d have to actually rotate the book every so often! I usually read in bed and switch hands every two pages or so, but also when I’m sitting I’ll sift around my chair etc. I can’t imagine holding it with the same hand for long amounts of time – and from what I can tell by observing my SO, neither can she (wish a cat was the problem, but she’s allergic to them 😀 ). I think it’s something you have to try in person. Instead of grabbing straight across you just rotate it down a bit to grab it by the meaty section. Admittedly I don’t change hands a whole lot while reading so I imagine that could get annoying if you do it a lot. But when it’s in the cover it’s just like holding any other ereader from the opposite side, using a thumb to swipe pages. One good thing about the accelerometer is it isn’t super touchy like with tablets. Even setting it on the side or down flat doesn’t rotate the screen; it has to be about 3/4 of the way around before the page flips. Hm, not sure what you mean by “you just rotate it down a bit” – if you switch hands I’d expect a 180-degree rotation on average (depending on the angle). What I’m saying is you’re not grabbing it at 180 degrees when changing hands. You just rotate the buttons until they are on top while changing hands. There’s not as much movement involved as you’d think and you don’t have to re-adjust your grip much because the corner fits into the palm of your hand while transferring. Plus there’s also landscape mode, which changes the whole dynamic, and I find it works quite well with the buttons. I’ll show it in the video review. Personally I like having the bigger section to hold it by with my larger hands so the Oasis suits me well. The Voyage was always a bit too thin and narrow along the edges for me to hold comfortably. Not a Oasis question.. What cover is that on the PW 3? I wonder if they make one for the Voyage? Looks pretty indeed, I was wondering myself. Noreve have really high-class and high-end cases. I had one for a previous phone of mine – it was quite expensive indeed, but after seeing it up close all hesitation evaporated. I wonder why it’s so expensive? Since the back of the case does not cover the back of the Oasis at all, I’d think this is gonna be an issue for those of us that like to keep our gadgets in pristine condition. This case essentially offers only protections for the front no? For being so expensive the case doesn’t really offer a whole lot of protection. You almost need a second beefier case for traveling and such. The Kindle Oasis feels really solid and strong with the metal infused frame, but I wouldn’t feel comfortable putting in it a bag with other stuff with just the included cover to protect it. I just got done posting a video and review of the charging case for the Kindle Oasis. It’s great that you will take the time before making the review. Since the 26th I’ve been after any data on the new KO, but haven’t find much. As you say, had the impression that the ones who made the reviews don’t read books very often, to say the least. In the other hand, people who posts in foruns (like the one from Amazon) are more like to be astonished by the device rsrs, though is already a good feedback. I have read elsewhere that the Oasis has bluetooth and text-to-speech capability but that they have not yet been implemented. Wondering if this is true and also wondering if Amazon will ever implement these capabilities. 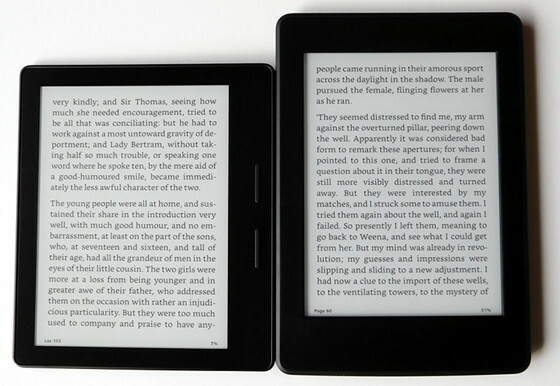 It’s time to give up on the idea of text-to-speech and audio support ever coming back to E Ink Kindles. Amazon has moved that to Fire tablets and I don’t see that ever changing. There’s a video interview on Youtube with people who work on Kindles and they make it very clear that all they care about is focusing on reading and making Kindles smaller and lighter. You can get a Fire tablet for $49 with audiobooks and text-to-speech support so there’s no reason to have those features on a dedicated ereader. Bluetooth is often included on hardware these days whether it’s needed or not because it’s so cheap to add. The component probably came with Bluetooth whether they wanted it or not.